Have you ever been stuck in a situation where you wished you could whip out your embroidery and indulge in some stitching, but there just wasn’t enough light to do it? Think: airplanes, cars, trains, hotel rooms, lobbies, libraries, waiting rooms. Think: power outages. I know if I don’t have adequate light for embroidery, I just skip it. There’s no point in straining to stitch – and subsequently stitching poorly – because I can’t see my work well enough. Sometimes, it’s not feasible to travel with a full size light. Sometimes, you can’t use a full size light, anyway. There’s a really easy, portable, affordable, and tiny solution for these types of situations. It’s the clip-on mini light, often known as a book light. I have a few different types of these types of lights. They get me out of all kinds of lighting binds when I want to stitch but can’t use my normal light. The light I’m going to show you today is from Mighty Bright. We’ll talk about the light, see how it works, and discuss some pros and cons. I’ll also share a purchasing tip with you on how to avoid a dastardly marketing practice when shopping for mini book lights! The type of lighting for embroidery that I’m talking about today is what I’d call temporary lighting. 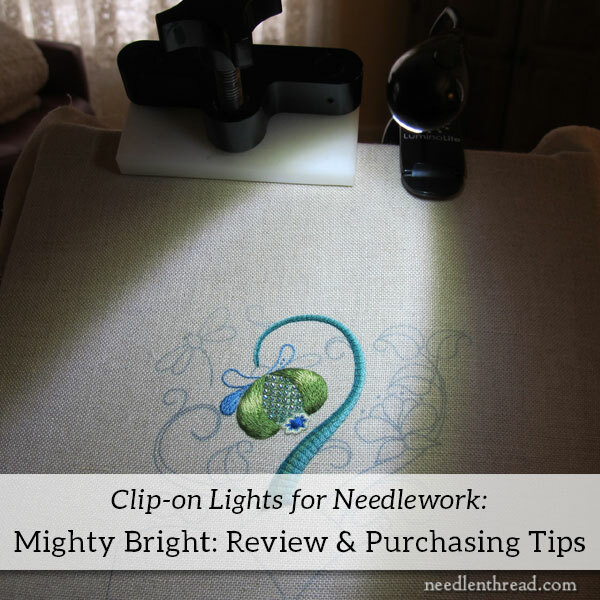 I wouldn’t use these types of lights as your permanent lighting solution when you’re stitching at home, but they’re a great short-term solution in certain situations. I’ve used these lights successfully for embroidery while staying in hotel rooms, in the car, on airplanes, in my living room during a power outage, and in situations where I didn’t or couldn’t have my regular embroidery lamp on. Some folks use them faithfully in embroidery classes and workshops, too. An extra little boon: I can even take fairly decent photos of my embroidery progress while I’m using these lights. They light up the stitching that well! 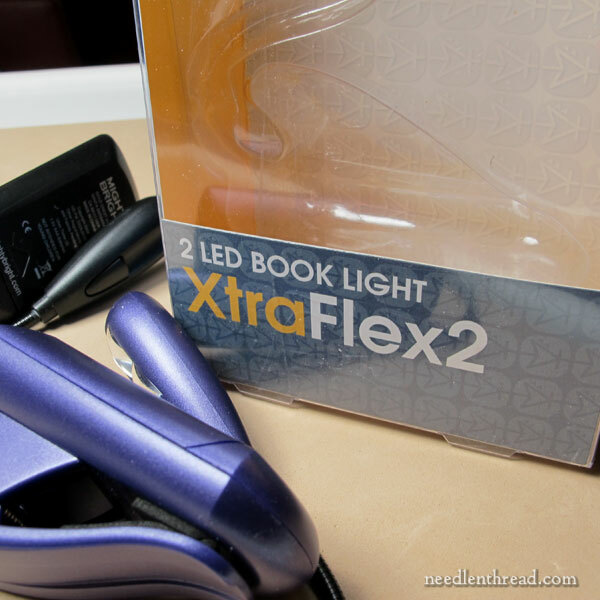 The light we’re talking about today is the Mighty Bright XtraFlex2 Book Light. It just so happens I have two of these – a black one and a purple one. It has a base that accommodates 3 AAA batteries. There’s a clip mechanism on top of the base. It has a short, very slim, very flexible goose neck, which is just about 7.5″ long, from where it comes out of the base, to the beginning of the lamp head. It has a two-LED-bulb light at the end of the goose neck. The lamp is usually battery operated (3 AAA batteries). Even with the batteries in, it’s a relatively light little contraption. The lighting on this little thing is pretty darned bright! The two-LED lamp head is turned on with a button on the back of the lamp head. One click (to turn the light on) turns it on to its brightest setting with both LED lights on. A second click with turn one LED light off, and give you a slightly “dimmer” setting. The light’s not any dimmer – there’s just not as much of it! 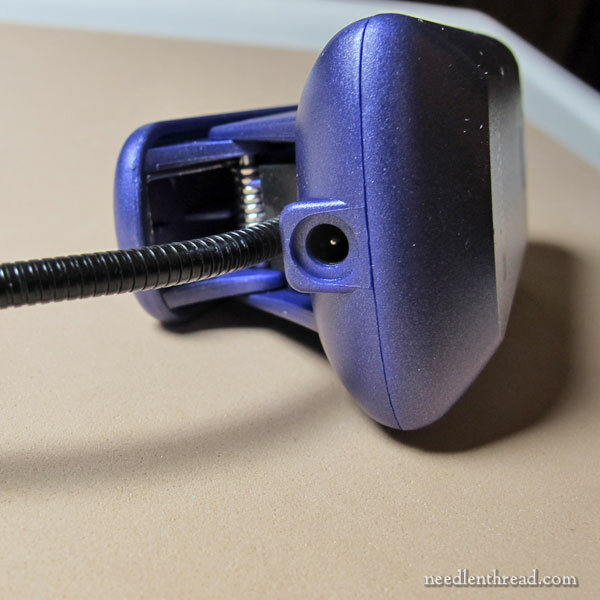 The back of the base features a jack input, so that you can use an adapter to power the light if you want. 1. Apparently, you have to use a special adapter made for this light. It costs about half the price of the light itself. I somewhat doubt that you’d be restricted to purchasing only a special-made adapter, though. If you can find an adapter that matches the electrical specs for the light and the size of the jack, I don’t see why it wouldn’t work. 2. Any adapter you’d use for this would normally require a pretty long cord, and adapters are not, in general, known for having super-long cords. 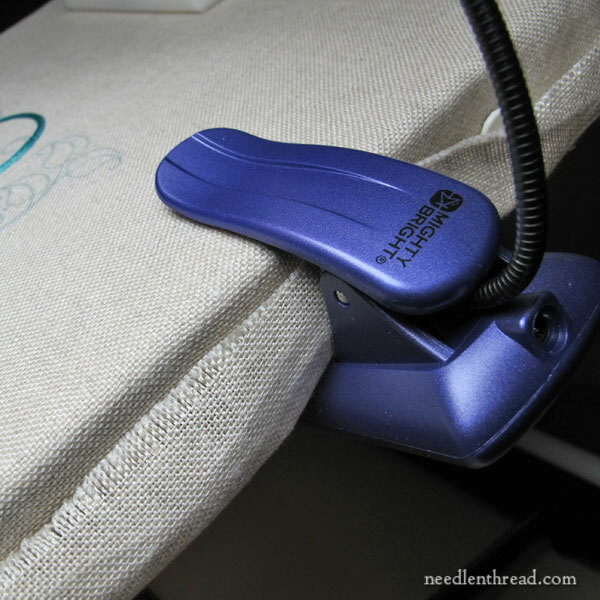 Think about it: are you always sitting right next to an electrical outlet when you’re stitching? Probably not. And even if your chair is close to one, normally there’s quite a distance between the outlet near the floor and your embroidery frame or hoop. If I’m trying to use this light with an adapter in my living room, it’s pretty much out of the question. I can use an extension cord, but the cord just pulls on the light, anyway, making it awkward and unstable. The only time I’ve found the adapter useful is when I’m in a hotel room at the table, and the light on the table has a plug at the base. In cases like that, the adapter has come in handy to save battery usage. The batteries are just regular AAA batteries. I haven’t timed how many hours they last, but it seems to me that I’ve used mine for at least 8 hours so far, since the last time I put new batteries in, and they’re still going. I’ve heard the batteries last even longer if you’re not using the brightest setting with the two lights. I haven’t tried that, but so far, the battery usage hasn’t been too devastating. When it comes to a clip-on lamp, there are two things that are really important – the light and the clip. If the clip doesn’t work well, who cares how good the light is? If the light doesn’t work well, who cares how good the clip is? So let’s take a look at the base of the light and the clip. The light can stand on its own, on the flat base. This means you can set it on a table, if you’re working on really small things underneath it, reading a book under it, or what-have-you. So you don’t always have to use the clip with it. If you’ve got batteries in the base, it’s pretty stable when used this way. However, given the small size of the whole thing, it’s more likely you’ll be clipping the light onto something. The light comes with a fairly hefty clamp. It works best when clipping onto something about 3/4″ thick or less. That said, it works on my Evertite stretcher bars just fine, which are 1″ thick. The jaws open up enough to fit on the frame, and they clamp onto the frame fiercely enough to be stable. The clamp mechanism on this light is pretty good. Of the different types of book lights I’ve used over the years, this clamp is the one that’s worked best on my frames. How well the light works for you on any particular embroidery project doesn’t just depend on the light, though. It also depends on the size of your embroidery project. Because book lights are generally made to illuminate a hand-held book or tablet, they don’t have super duper long necks. 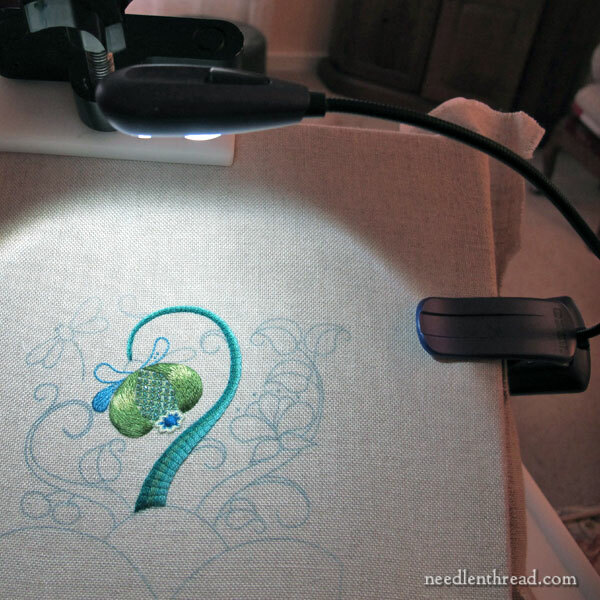 If you’re working on a huge piece of embroidery, the light may not stretch far enough to shine on your stitching area. It works fine on medium-sized pieces of embroidery. But on huge pieces, you’ll want to do some measuring before investing in the light. Like I said above, though, these lights shouldn’t really be a permanent solution to stitching lights – they’re more for travel convenience, outages, and special situations. Here are the two boxes for my two Mighty Bright book lights. The purple one (in the box on the right) was a gift. I was just rude enough to note that the tag wasn’t removed from the base of the gifted box. And I noticed something very interesting on the sticker on the base of that box. At first, this didn’t mean too much to me. I knew it was a book light, after all. But then I saw the price, which was significantly higher than I paid for mine. So I decided to search around online and see how the light was listed for sale in different places. Third-party sellers on Amazon are a great example of this, but I found it across many platforms – from craft stores to book stores to music stores. The same light, labeled as a craft light, a sewing light, a music light. And generally, priced more expensively for the narrower niche markets. No matter what use they’re labeled for, the Ultraflex2 is always the same light. 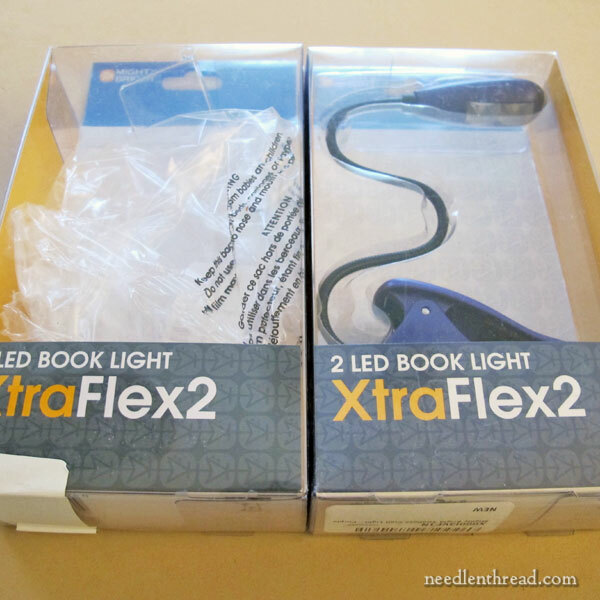 Mighty Bright has different shapes and configurations of book lights, but if it’s the Ultraflex2, it’s the same light, whether it’s labeled as a book light or a craft light. You should expect to pay under $20 for the light. 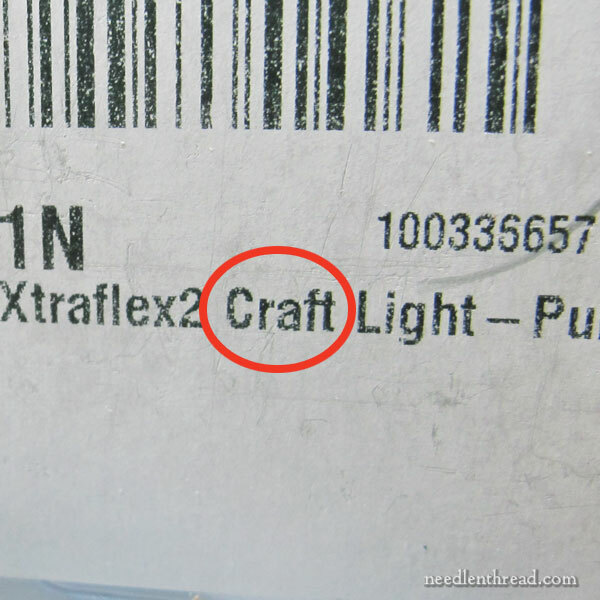 If it’s labeled as a craft light or embroidery light and it’s selling for $30, don’t be taken in! Pros: It’s small, it’s light, it’s affordable, it’s bright, the clamp works, and it uses batteries, not a plug. An adapter can be purchased for it, if you want to use a plug. Cons: The adapter doesn’t come with it. The unit itself is not rechargeable. You actually have to replace the batteries or use rechargeable batteries. I love this little light! Down the road, I’ll compare it to another book light that I have, that’s rechargeable. Both have their pros and cons, but the Mighty Bright edges out the other one, thanks to its rugged clamp and very adequate bright light. The Mighty Bright Ultraflex2 reviewed above, for under $20. The regular Ultraflex with one LED bulb, for just over $10. The Mighty Bright light looks an amazing bright light to own, I’m looking for one for my Stitch and Knitting group where I need a good light to stitch and my light/magnifier is to big and needs a plug outlet. The only thing missing is a magnifier which would be the perfect travelling light, but then it would be more expensive with a magnifier. The cost of the lighting is very affordable here in the UK it’s £15.99 which is great. I will think about buying one of these for my stitching group. Thanks for taking the time to review the Mighty Bright light and showing us all the different elements to the light. I got a very similar light with a magnifier at the knitting and stitching show. It has made such a difference as I can now embroider and watch to at the same time without having to keep stopping specs! I think the company is called lighting solutions. Missouri Star Quilt Company carries a wonderful version of the Mighty Bright that has an attached magnifier and a clip-on base for tabletop use for $24.95 online. I love mine. I do a lot of stitching during intermission at the theater, and the low light bugs me there. A head lamp is also out of place there. This could work for that. I love my XtraFlex2. We travel, and it’s great in hotel rooms that don’t have enough lighting for embroidery. I made a drawstring bag for it. But I suggest you remove the batteries before you pack it. The on button is very easy to accidentally push on in your luggage, then the batteries wear out too soon. Mary, will this light clip on securely to an embroidery hoop? Hi, Ida – yes, it does, if you clip it where the hardware is on the hoop. That’s where it works best for me, anyway. Some folks suggest putting scrap fabric between the clamp and the fabric in the hoop. I haven’t had to do that. I have recently been looking for a lighting option that would allow me to work while I am flying. It looks like this light would be great on a frame, but it would appear that the clamp wouldn’t work on a hoop, is that right? Do you have any advice or recommendation for lights that work with hoops as well? I have tried the headlamp option, but find them to be very uncomfortable! Thank you for the amazing site. I have learned so much through your many entries! My apologies, it looks like I missed Ida’s comment and your response. I think I will order one of these to try. Thank you again! I’m curious as to your reference to stitching while flying. How do you get scissors past the security people? That’s what stopped me on many occasions. I have that light and love it also. Another one I love is by Ideaworks. It lights a slightly bigger area, costs under $20, and runs on batteries; but it also plugs into my computer by way of a USB port! Saving batteries. There are 3 levels of brightness by just touching the base. 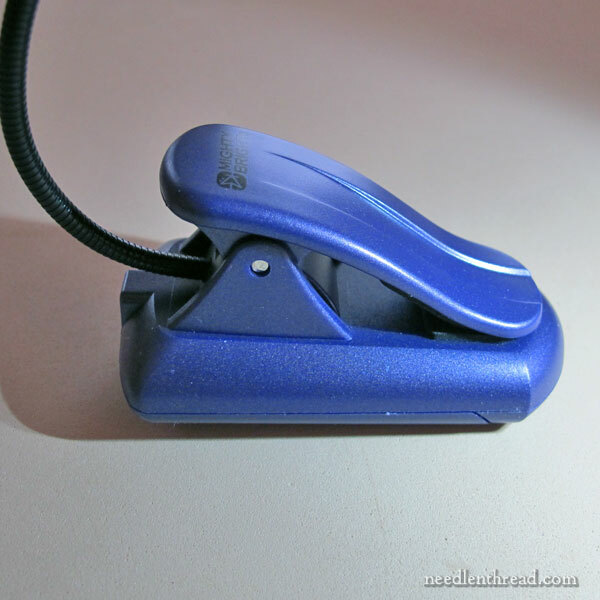 It doesn’t clip, just sits nicely on the desk and folds up to store or change height. I really like it. Not quite as travel-friendly, but could work if you travel with a laptop. As another lady mentioned, headlamps are great! We started using them when we used to do a lot of backpacking and other camping. Now we use them frequently around the house…great for everything from walking the dog at night to sewing/crafting/reading to working on the car…even cooking if the power is out. The newer ones are very lightweight (usually 2-3 AAA batteries and some are rechargeable) and the LED bulbs can be very bright. I keep one handy when I’m sewing or stitching. I sometimes use the mighty-brite lamp with the goose-neck. I have the adapter, and I find that it’s very useful – the cord isn’t super-long, but long enough that if your chair does happen to be near an outlet, you could use it. What I find best about it is that, with batteries, yes, the light works and starts out bright, but there’s a drop-off in brightness after a fairly short while. I think it drains the batteries, and as that happens, less power is supplied by the batteries, so the light dims somewhat. If you turn it off and on again, you notice that it comes back bright, but again, fades fairly quickly after that. With the cord, there’s no drop-off. True, true, Julie! Some good examples: telescoping magnets to pick up dropped needles or pins. These are pretty expensive (over $10) in needlework stores. You can pick them up at a hardware or automotive store for just over $2. Another example: thumbtacks for setting up stretcher bar frames. The ones sold in needlework shops are very expensive for very few thumbtacks. You can buy a bulk box of 100 at a hardware store for a couple bucks! The same holds true for storage containers – they cost considerably less anywhere other than craft supply stores. I wonder if this is a similar phenomenon you find in dry cleaners where a woman’s blouse costs considerably more than a man’s shirt? I’ve had the hammerhead version for some time. It’s reliable, bright, and stays in my computer bag along with a small project. Working on ornaments in hotel rooms while watching bad TV is better than just watching bad TV. I was wondering about a clip on light. When I’m doing close work I sit at my husbands desk, and put his desk lamp over my work. It works good but then when he wants to use his desk, I’m there. Your post has given me some good input. I have started my petti point, and a light like that will help, even for a real short time. I love my old school Mighty Bright – one LED is ample (but I am tempted by 2 LEDs), but I was disappointed they changed from small disk batteries to AAAs. The disk batteries are slightly more $, but they weigh much less. I did get an adapter cord, but rarely use it. I used to use one of those lights that hangs around your neck, but after a while of wearing it, it felt really heavy with all those batteries. We even got the Mighty Bright Floor Light with Magnifier – it’s awesome and convenient for next to the chair. Thanks, Mary for yet another practical and timely tip! (I just registered for a needlework conference and the brochure suggests bringing your own lighting.) I checked out the Mighty Bright website and decided to go with the Hammerhead. It has 6 lights and emits 55 lumens. Your tip on pricing was invaluable! I purchased my light on Ebay and got one with a stand—for under $20. Now to rummage around my electronics “junk” for an electrical adapter. 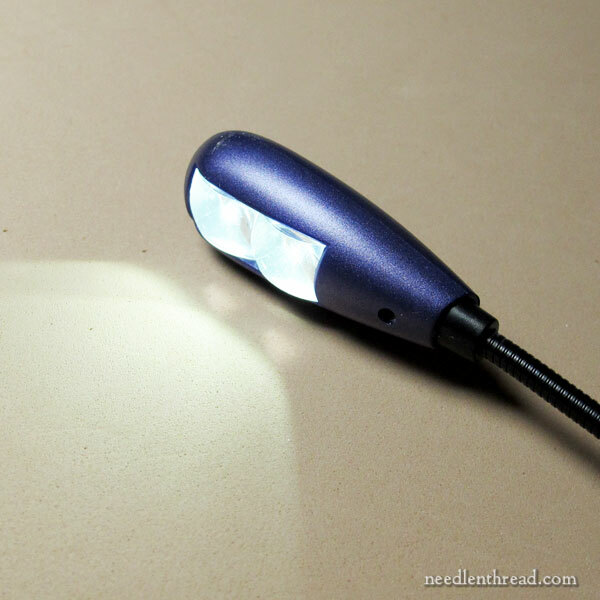 I use a head lamp with lights on each side & a wonderful magnifier. My husband picked it up at Harbor Freight. You can still wear your glasses underneath and it’s not heavy. (Fits comfortably ) It’s also super cheap. I think he said 5 bucks. I love it. I used to work for Barnes & Noble. They carry this light. I bought mine there and have been quite pleased with it. Just a tip for Canadians, the Hammerhead light is available on Amazon.ca (Canada) but costs CAN$26. The adaptor is an additional CAN$37. Amazon.ca does not offer the two in combination as Amazon.com does so you’re stuck with paying $65+tax for the two. The Mighty Bright XtraFlex 2 is CAN$30.32. The one-bulb version is the cheapest at just under CAN$7.00. Hi Sarah, saw your question regarding traveling with scissors. I went LA to San Francisco twice within a month just for the day to the SF School of Needlework and Design for classes which, btw is fabulous, great people, and took with me needles and a small scissors, the Revlon brand curved blades type in my purse and had absolutely no problem with TSA. Just don’t take any big scissors or special scissors that would upset you if they’re taken away from you. Read in the TSA website their guidelines. Hope this helps. 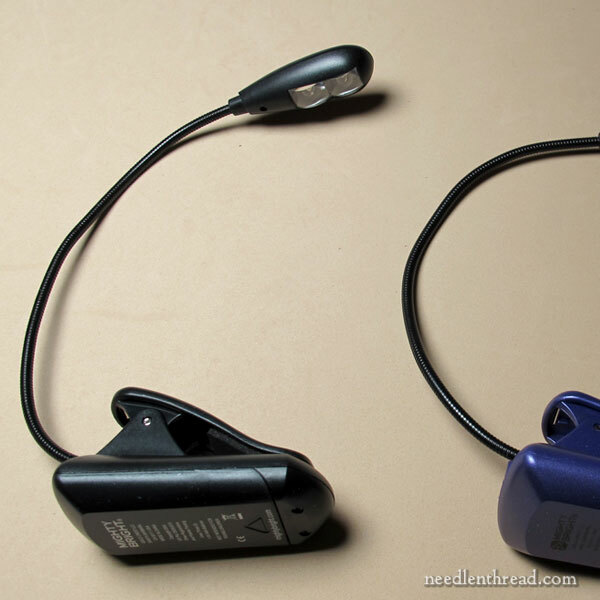 I have both the book light and the hammerhead clip-on light. I use both depending on the project size to supplement my Ott floor lamp. I like the additional light focused right where I am stitching. Also, as you found, many items have various prices when labeled differently. I bought my Ott light at Lowe’s. It was labeled as a shop light, but the only difference is that it is black instead of cream or gray. It was less than half the price of the same light in the fabric store. As a former horse owner, I am reminded of a wry joke regarding the kind of pricing shenanigans you mention! Alas, it’s not just the “crafty” types that get beat with the mark-up stick. Q: What’s the difference between a horse bucket and a cow bucket? This is exactly the lamp I use when I go to embroidery courses because I know the classroom can be a bit dark when the weather is grey. I’ve been using it for years and it works perfectly. I just take the batteries out when travelling because the light can switch on “by itself” in a messy bag… And it’s perfect on a slate frame. Thank you for all of the wonderful information on your website. Your article on the Mighty Bright clip on light was so informative that I did purchase one and everything you said about it was spot on. I can now embroider in the evenings. You may want to review the Mighty Bright Orchestra which has 9 LED light with 100 lumens. This one supplies twice the light that the Hammerhead supplies. Amazon has it for $38.99 plus $11.50 for adapter.